Greeting cards to write, presents to buy, parties to host, and dinner dishes to plan, holiday can sure be a stressful time. The last thing you may want to do is research on the perfect holiday snacks and treats to make for the big events. 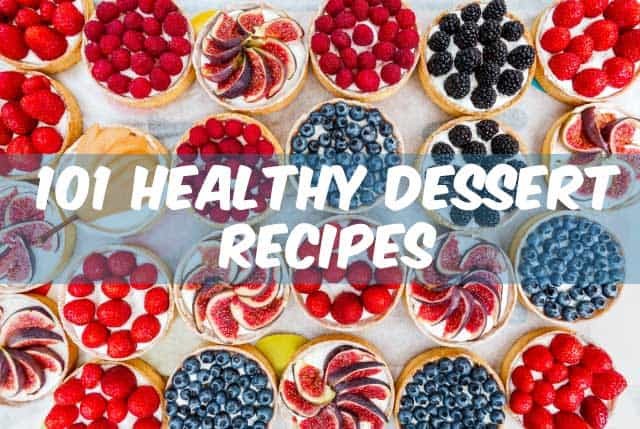 To make it a much more enjoyable time for all the home cooks and bakers, we have compiled this awesome list of 101 Healthy Dessert Recipes from all the best cooking blogs and foodie authors across the internet. A word of warning, do not go through this list on an empty stomach. Vegan Chocolate Chia Pudding is an excellent Christmas pudding choice for all the adults who love the rich chocolate taste but still want to be healthy over the holiday. Fruity Apricot Kolaches is light and finger-licking good as a holiday morning treat for everyone. The Cranberry Dark Chocolate Biscotti is holiday favorite for all latte and coffee lovers. These truffle-like Dark Chocolate Coconut Bites is a little piece of fluffy heaven in every bite! The Peanut Butter Cookie Dough Balls are absolutely the most scrumptious protein snack you will ever taste. You will find your family constantly reaching for more of these little mud balls. Move over Gingerbread cookies. These healthy gingerbread muffins will wake up everyone in the house in the morning with that irresistible aroma. If you are in a rush to make some last-minute party munchies, healthy peanut butter cookie dough bites will be ready in 15 minutes. And guess what, there is absolutely no sugar in this recipe! Everyone will reach for seconds when it comes to these easy no-bake mini fruit pizza tarts. These yummy Inner Goddess Chocolate Truffles will guarantee to Wow any chocolate lover. The 5-minute Apple Crisp is so easy that even your kids can make it themselves. It is a wonderful afternoon snack for the cold winter. Sugar cookies is a must for the holidays. But these whole wheat sugar cookies will allow everyone to enjoy the sugary treat without feeling guilty afterwards. You can never go wrong with these white-chocolate bark. Depending on your preference, you can swap out almonds for pistachios, walnuts, and macadamia nuts. For the people who do not like chocolate and peppermint, the fruity lemon bar will hit them in the right spot. For the cookie lovers, this cranberry-nut chocolate chip cookies is the embodiment of everything Christmas. Who can say no to these amazingly tasty Strawberry Santas! Unlike the traditional recipes that call for numerous butter sticks, this Apple Spice Cake tastes just as good with much less fat and calories. The buttermilk pralines will be a favorite in any parties. And the best thing about them is that these little bites will last up to two weeks in vacuum containers. Popcorns are great healthy treats. Still it can be a little plain for the holidays. Why not create these adorable Snowman Popcorn Cups to please the crowd? Everyone loves ice cream and cake. Your family will go nuts over this guilt-free peppermint ice cream cake. Pears have that irresistible aroma and texture that will make anyone fall in love with the season. The Quick Baked Pears will no-doubt become one of your all-time favorite dessert recipes. All the children won’t be able to stop reaching into the cookie jar for more of these white peppermint snowball cookies. Brownies and butterscotch are wonderful holiday treats. But they usually pack a lot of sugar and fat. This Brownie with Butterscotch Drizzle recipe has only half the sugar and twice the flavor. Who can forget the pumpkin pie! This Healthier Pumpkin Pie calls for graham cracker crumbs and coconut milk to lessen the fat and calories so that you can enjoy a second serving. Instead of frying your apple fritters, this baked apple fritters is lighter on the stomach and gives a new meaning of fritters. You can even experiment with pears, peaches, strawberries, and blueberries. So beautiful, so healthy, yet it only takes 15 minutes. The Christmas tree fruit plate is a fantastic way to wow your family with minimal effort. And for those with some skills with their knives, try this cute Christmas Tree watermelon wedges. Christmas will be incomplete with jello and candy canes. Combine the two, Voila! Candy Cane Jell-O snack! For the adult version, try adding some wine or liquor into the mix. To dress up simple fruits for the holidays, try making these awesome grinch fruit kabob. These are totally adorable! It is a caramel season. If you love caramel, this made-from-scratch caramel Turtle Bar recipe will allow you to lower the calories without sacrificing the taste. These heavenly light and melt-in-your-mouth Coconut Chiffon Cupcakes with Marshmallow Frosting are absolutely scrumptious to the last bite. Reindeer Pretzel Candy is a wonderful idea as gifts for co-workers, neighbors, and kids’ classmates without hurting your wallet. The moist Cappuccino Trifle is a light finishing touch to the dinner feast. It will satiate any coffee lovers urge to grab a cup of coffee. If you cannot decide on butterscotch and chocolate chips, this Chocolate Chip Butterscotch Bar recipe will allow you to have both in this situation. The holiday will be incomplete without some brown sugar, cinnamon, and pecans. This Cinnamon Streusel Crisp will cheer up everyone in the room even the Grinch. To appease all the frozen treat lovers, this Frozen Peanut Butter Pie will get all of them squeal in delight. When it comes to chocolate cake, who can deny an awesome slice of German-chocolate cake? This Light German-Chocolate Cake recipe will allow everyone to dig in without worrying about the sugar and fat content. When you mix sugar cookie with raspberry jam, you will get this irresistible Linzer Thumbprints. For all tea lovers and people who prefer lighter desserts, these Mini Raspberry Tarts will be the perfect finger food. A holiday party will not be the same without a homemade apple pie. This Surprisingly Light Apple Pie will get everyone asking for seconds and even thirds. You may want to make an extra just in case. Another excellent light and fruity option for non-chocolate dessert lovers. These Coconut-Lemon Minis are perfect for any occasion throughout the year. For individuals who suffer from lactose intolerance, this Chocolate Marble Cake will truly make their day. Instead of using dairy milk and cream, applesauce and almond milk gives this cake that heavenly moist texture that all cake lovers crave for. Tiramisu is a simple yet tricky dessert to master. This Tiramisu recipe is a must-try for all those who prefer a more grown-up taste of bittersweet chocolate with a tinge of Kahlua after-taste. These Chocolate Oat Cakes are just too delicious yet healthy as a holiday morning treat. These Scottish chocolatey treats will get all the British friends craving for another. A slight hint of ginger makes this Ginger Angel Food Cake so inviting. And with a lime-spiked raspberry sauce, it will appease all dessert lovers from young to old. After playing in the snow outside, nothing is better than a hot cup of cocoa and these Mini Date-Nut Snowballs. For the girls who love dainty colorful pastries, these Almond Snowball cookies will make them go Ga-Ga.
For the gluten-allergic people, these Gluten-Free Blueberry Muffins is a wonderful morning snack that taste amazingly awesome. And packed with all those gooey blueberries, they are a great alternative to pancakes or waffles. Instead of the traditional pumpkin pie and pumpkin bread, why not make it a new tradition with this Pumpkin Cheesecake? For those who are looking for a healthier version of sugar cookies, these Pecan Sandies cookies filled with creamy goodness will make you wonder where are all those nuts? The holiday schedule can make everyone running around nonstop. These Apricot Oat Bars are so easy to make and convenient to carry in the purse as a quick energy snack. Dates is a great way to increase fiber contents while decrease sugar contents for desserts. This Pecan-Date Pie is so gooey and crunchy at the same time that it will make everyone sigh with happiness. If you are looking for low sugar and whole grain desserts, look no further. This Parsnip Spice Cake with Caramel Icing is here to save the day. Molasses actually is packed with a lot of healthy properties. Try making these delightful Molasses Crinkle Cookies for the holiday. If you love a little bit of saltiness in your desserts, this Salted Caramel Apple Pie will satiate both your sweet tooth and your savory taste buds. Instead of buying store-bought candies for your children, these Pumpkin Spice Fudge will make them asking for more throughout the year. Yule logs can be a tricky business. Instead of using heaps of heavy cream, try this Greek Yogurt option of Chocolate Yule Log. Taste just as wonderful without the fat. When you throw grapes and pears into the oven, you will be amazed how these two ingredients can turn into such out-of-the-world treats. Instead of using loads of sugar, this Roasted Grape and Pear Kuchen is a wonderful healthy dessert for everyone. For the weight-conscious individuals, these Mini Raspberry Cheesecakes will allow them to nosh on these delicious treats without worrying about portions. For all the German dessert fans, this Pfefferneusse recipe will allow you to enjoy the traditional nutty, citrus delightful cookies in a healthier way. These Snowy Chocolate Pine Conesis a great way to incorporate some fiber into the desserts. Take that veggie and fruit haters. Turn on the adult flavor by incorporating an oak-infused bourbon taste to your desserts. These Bourbon-Pecan Tassies is a wonderful treat to go along with coffee. Instead of buying the artificial gingerbread-flavored coffee for the holidays, why not try out this Iced Gingerbread Biscotti to bring in that rich flavor in a natural way. Although cinnamon bun can be a great holiday treat, this special time may call for the Pecan Sticky Wedges. It will get your family gather around, laugh, and getting their fingers sticky pulling this enticing bread apart. Christmas is a time to catch up. For afternoon and tea time gathering, this Chocolate Chip Cream Puff is a must for all girl talk time. Who can forget cranberries! Instead of using it as a sauce, try using it in this Maple-Walnut Cranberry Pie. That tarty flavor is just the perfect contrast against the other sweet ingredients. For last minute treat ideas, this Pecan Pie Baked Apples will save the day and make everyone fall in love with apples again. Who knew popcorn can make ice cream POP? This Mini Popcorn Sundae recipe only takes seconds to make for all those children begging for a sweet snack. For all the pancake and waffle fans, this Cinnamon Apple Dutch Baby will make them contemplate their loyalty. Nutella is truly a life saver during holiday times. If you have a jar of this endless yumminess, you can quickly whip up some of these Healthy Nutella Chocolate Candy Cups for your guests. Key Lime Pies is a superb way to clean off all that oily taste in your mouth after the dinner feast. That light tarty taste also a wonderful treat for the spring and hot summer days. The winter time is THE season to make Smores! This Skinny Frozen Chocolate Smores Pie will make everyone dive right in. Not everyone like hot chocolates. For those who like a cool treat during the winter days, this Skinny Frozen Hot Chocolate will hit the right spot. This is another awesome portion-controlled treat idea. These little Healthy Caramel Pumpkin Pie Pudding will make all your calories-counting friends happy. This is no simple muffins. Once you take a bite, you will find yourself sighing over that warm liquid chocolate oozing out from the center. This Nutella-Stuffed Cinnamon Sugar Muffin is INTENSE! For any family members and friends craving for donuts and donut holes over the holidays, whip up these Baked Pumpkin Donut Holes to satiate their cravings. If you don’t tell them, they will never know the secret. For all the gluten-free fans, this Flourless Peanut Butter Chocolate Glazed Cake is so pretty to look at and so insanely rich for the palate. If you have only 1 minute to spare, this Gingerbread Mug Cake will be your best friend. Because it only takes 1 minute to make. For the simplest gift and treat ideas, these crunchy sweet Honey Roasted Almonds beats store-bought brands any day. And it is made with love and care! If you use fresh pumpkins over the fall and winter, you can dry the pumpkin seeds to make these awesome Candied Pumpkin Seeds as holiday treats and gifts. How cool is that to upcycle the seeds into yummy healthy snacks! If you are into making cute looking festive treats, you will not want to miss these almost-too-cute-to-eat Christmas Tree Meringue Cookies. Frozen Yogurt Treesis another cute yet tasty recipe to make for kids to play and eat. Instead of making the traditional calories-loaded Christmas pudding, opt for this Healthy Gluen-Free Raw Christmas Pudding. And guess what? It takes only 5 minutes to create. Candied apples are pretty to look at, but it is so covered with sugar that it is not healthy to eat the whole treat. For the parties, why not try out this Mini Snow Candy Apples recipe. Persimmon is a relatively lesser known fruit for the Western people. When ripe, they turn into these intensely sweet meat that has been dried as a treat for many Eastern cultures. This No-bake Snowball Persimmon Cookies is a great way to merge the East and West food cultures together. These banana snowmen are so easy to make that you can delegate the task to your kids. Eggnogs may not be your favorite holiday drink, but it definitely turns almost any desserts into a holiday special. For those who love a good fudge, do try out these Skinny Eggnog Fudge. They are so good yet much healthier than the traditional fudge. Currents is almost like cranberries but more refined in taste. These Currant Cookies is a delightful alternative if you are sick of cranberries and apple desserts. Quinoa isn’t just for side dishes and salads. When cooked or grinded into a flour, it can create some appealing desserts and treats with a fresh nutty flavor. If you have any family members or friends who are allergic to nut and gluten, this is the perfect Gluten Free Quinoa Chocolate Cake to make for the celebration. For all the vegans and vegetarians out there, this Pomegranate Chocolate Mousse can’t be missed as it is egg-free and dairy-free! Just 5 ingredients and 7 minutes are needed for this Prosecco Soaked Dark Chocolate Covered Strawberries No one will know how you can manage to look so dazzling and still have time to make all these scrumptious treats. Parfaits are adored by kids and adults. This Skinny Strawberry Cheesecake Parfait recipe will allow your guests to enjoy both world of parfait and cheesecake without compromises. If you are not into pumpkin bread, a moist Banana Cake with Coconut Cream Cheese Frosting will be the perfect substitution for the occasion. The winter is an easy time to get sick. This Raw Coconut Ginger Amaretto Bites is perfect for the celebration and boost up everyone’s immune system over the season. Who says avocados are only for toasts, salads, and sushi? It can be used as a dessert ingredient to swap out cream and milk to produce that silky creamy texture that melts in your mouth. For people with lactose intolerance, this Mint Gluten Free Cheesecake with Avocado Brownie Bottom will allow you to enjoy the dessert without stomach cramps. If you are looking for a homemade gift idea, these 4 Ingredient Peppermint Chocolate Crunch Bars is so easy to make and it is dairy-free, gluten-free, and vegan friendly. As the Paleo Diet health trend increases in popularity, no doubt your healthy friends and family will enjoy this 4 Ingredient Oven-Roasted Paleo Candied Pecans treats. No dairy, refined sugar, and gluten. Snack away people! We sincerely hope that this list has given you some inspirations for your party plans and gift ideas. If you have a personal favorite recipe or blog author you wish to share with other readers, please leave us a comment. We would love to hear from you. And in the meantime, happy holidays! No. 13 Lemon bar link clicks to No 12 White-chocolate bark recipe. How can I see the lemon bar recipe? Thank you for catching that one. I have fixed it.